(Office of Her Majesty – Press Department – Amman) - Her Majesty Queen Rania Al Abdullah encouraged educators to redefine their roles as leaders of hope at this year’s Teacher Skills Forum, and called on them to instill the values of peace and co-existence in their students in order to face today’s challenges. In a speech she delivered at the forum’s opening session on Saturday, the Queen urged teachers to educate their pupils about “hard work and resilience,” and about how to build bridges that connect, instead of barriers that separate. In her remarks, the Queen reflected on the state of the global economy, expressing concern about its continued stagnation and the extent of polarization the world is experiencing today. “Just by looking around us, it becomes evident that even humanity fails humans sometimes,” Queen Rania explained. “Uncertainty, doubt, and dejection have dominated conversations everywhere. We are in desperate need for hope and a brighter future, where prosperity can take hold,” she added. 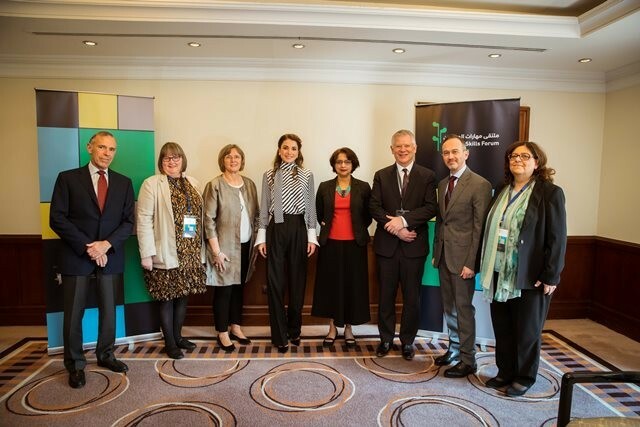 The third annual forum, currently taking place in Amman, is a conference hosted by the Queen Rania Teacher Academy in partnership with the International Baccalaureate program. This year’s gathering focuses on the process of restructuring the way in which educators teach in order to enrich their students’ learning experiences. Her Majesty informed teachers that their role is highly prized, urging their continued support and empowerment, and referring to them as the greatest investment during times of regional turmoil. The Queen also projected her hopes for the Initial Teacher Education Diploma, which will be graduating its first batch of well-equipped and highly skilled educators this year. She pressed the audience to “imagine the immense impact these individuals will bear on each and every student” once they become proactive members of the country’s education workforce. “The more equipped a teacher is with skills and tools, the more solid and innovative his teaching will be,” she said. Her Majesty likened the theme of this year’s forum, Restructuring How We Teach, to the work of well- organized engineers, who consolidate separate resources for the achievement of their construction goals. “Visions without carefully devised plans are mere dreams, prone to dissipation in the face of tough challenges,” she also underscored. Her Majesty referred to teachers as the “engineers of the future,” imploring them to help students master the building of a great future. “Teach them to dream, persevere, and thank God for His blessings. Teach them that their differences are worthy of celebration,” she concluded. Mr. Haif Bannayan, the CEO of the Queen Rania Teacher Academy, expressed his pride in the academy’s efforts towards global integration by forming solid partnerships with various prominent international organizations. “We believe that our greatest impact has been our emphasis on the importance of teacher training and preparation, and our dedication to promoting teaching as a long-term career rather than a regular job,” he added. Bannayan explained that although the academy has reached around 50,000 teachers in Jordan through its different programs, its most significant milestone is the pre-service diploma program enacted in partnership with the Ministry of Education, with technical support from the University College London (UCL)’s Institute of Education (IOE). Her Majesty attended the forum’s opening session along with other distinguished world education figures, including, the Chief Executive of the Education Development Trust, Dr. Steve Munby, and Expert in Residence of the Innovation Lab at Harvard University, Dr. Tony Wagner. Director General of the International Baccalaureate program, Dr. Siva Kumari, attended the opening session as well. She discussed the power of teachers in classrooms and the power of education in the creation of an evolved humanitarian citizen. This year’s forum welcomed over 900 participants from various countries including Lebanon, Palestine, Syria, Egypt, Iraq, Kuwait, Morocco, Saudi Arabia, the United Arab Emirates, Qatar, Mexico, the Netherlands, the United Kingdom, and the United States. The third annual Teacher Skills Forum is hosting over 130 workshops addressing mental health, interactive pedagogies, leadership, early childhood, innovation and entrepreneurship, and special learners. Other sessions included teacher and professional-led activities, reflective sessions, and exhibitions addressing the topic of reconstructing and deconstructing learning targets.